New adaptation of Emily Brontë’s classic novel about frustrated love. When Heathcliffe (Solomon Glave/James Howson) is adopted by the Earnshaw family, he falls into a troubled romance between himself and his foster sister, Cathy (Kaya Scodelario/Shannon Beer). One wonders whether great stories can be adapted too much; if there is a point where the tale is so deeply ingrained in the public consciousness that it simply cannot survive another retelling. On the other hand, perhaps a story can survive endless tellings and retellings, or that a mark of a truly great narrative is that it does so. 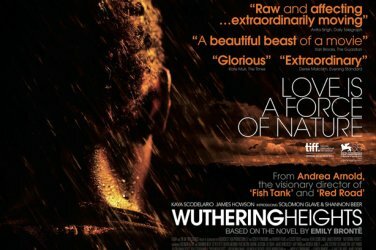 Whatever one’s thoughts on those questions, Andrea Arnold’s adaptation of Wuthering Heights is a clear attempt to inject new life into the classic Emily Brontë story. More overt racial tensions have been thrown into the storyline with a black Heathcliffe (though given recent events, it may have been more relevant to keep him as a gypsy), and there is a greater emphasis on violence and brutality to both humans and animals than in many other versions of this work. Unfortunately, none of this serves to make a compelling watch. Part of my issue is that I do not think the story of troubled lovers between Cathy and Heathcliffe is a great tale. I find it to be astonishingly dull and for me it requires universally compelling performances to make it work. The only point where this is effective is in the very early moments of their relationship: beautiful, wordless scenes of innocent sexual awakening between the young Cathy and Heathcliffe (Shannon Beer and Solomon Glave) set against the backdrop of the windy moors spin out a beautifully subtle romantic tension. However, beyond this great start, Arnold takes too much time indulging in ponderous inactivity, and the film plunges into becoming deeply uninteresting. There is also a sense in which the film believes itself to be shocking when it simply is not. The C-word in a Brontë adaptation? The last taboo! As the characters mature, the actor’s adult counterparts fail to work. Kaya Scodelario’s Cathy is given a bit of a thin treatment in the script, which sticks too closely to focussing on Heathcliffe, making it an even greater shame that James Howson’s performance is so unengaging and unconvincing. With the central relationship failing to win over hearts and minds, the film is really struggling. That these great flaws should be there is surprising from a filmmaker of such great reputation as Andrea Arnold, but this is a very confusing directorial effort. Stylistically, the film veers from being triumphant to disastrous. The shots of the beautiful countryside and individual characters are often breathtaking, and she quickly establishes an effectively harsh, threatening and cold atmosphere (the whistling of a harsh wind lasts throughout almost the entire film) but there are whole scenes which take place in almost total darkness. True to the period? Perhaps, but this is a visual medium. I’d quite like to be able to see. Added to this issue is the distinctly patchy nature of the film. It slowly progresses but seems to lack direction and its glacial more than two hour running time is filled with not very much. A funeral here, a funeral there, but you don’t really care. The only element in which this does shock is the sheer level of animal cruelty portrayed in the film. No animals were harmed in the making of the film, but as rabbits have their necks broken, sheep are sliced open and live dogs are hung from gate posts. All of which is deeply unpleasant and utterly pointless. Indeed, the film as a whole seems rather pointless. This is an unengaging adaptation of a story which has been told too much. It fails to thrill, shock or move. Despite clear moments of excellence in the early moments, this is a boring piece of work which lacks purpose and emotional heart. Whatever happened to Jack Black?